Learn How To Make South Indian Style Peanut Garlic Chutney recipe with a step-by-step video tutorial. 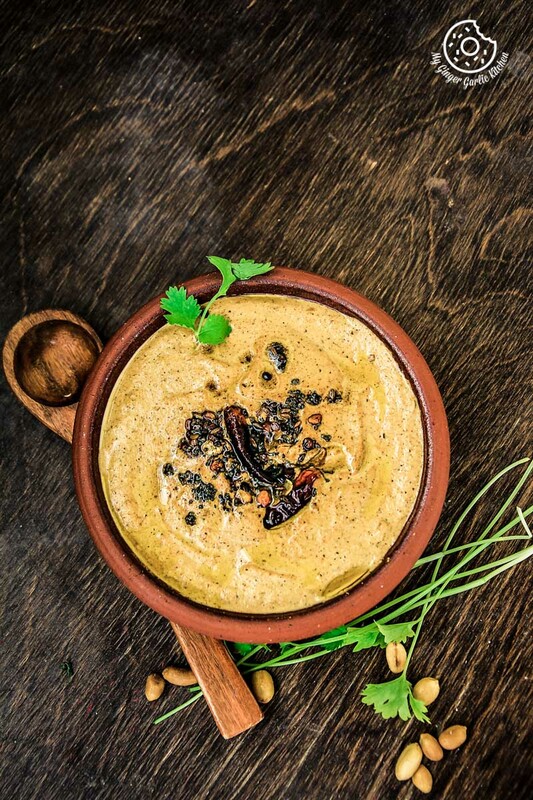 This South Indna Style peanut Chunety is a thick, classic, creamy, sweet, and spicy-nutty chutney. This is best accompanied with idli, dosa & uttapam and all type of parathas, or any other Indian snacks. I’ve just returned from a weeklong holiday and all I can say is that the last week was so fun and adventuresome for me. There are a couple of reasons to say that. First, the climate was summery and we did all the entertaining activities one can do during summertime. Second, it was hubby dear’s birthday so the celebration had to be fun. We both took our week off and roamed around the city, just like a tourist. Seeing your own city from a tourism point of view is so enthralling. Isn’t it? Third, this year we could finally manage to have a couple of midnight beach parties which were a long due. I am not entirely back from the holiday mood, but I decided to share a couple of regular posts this week, as the weather predictions suggest that the initial days of this week are gonna be rainy and cold again. However, I so wish I could put some summer warmth in my pockets and enjoy it throughout the year. Or at least I can say that I am hoping the weather to be summerish this whole month so that little ‘A’ and I could soak all the sunshine outside. I wasn’t able to make a proper meal for my family last week, but I made this perfect peanut garlic chutney for them. 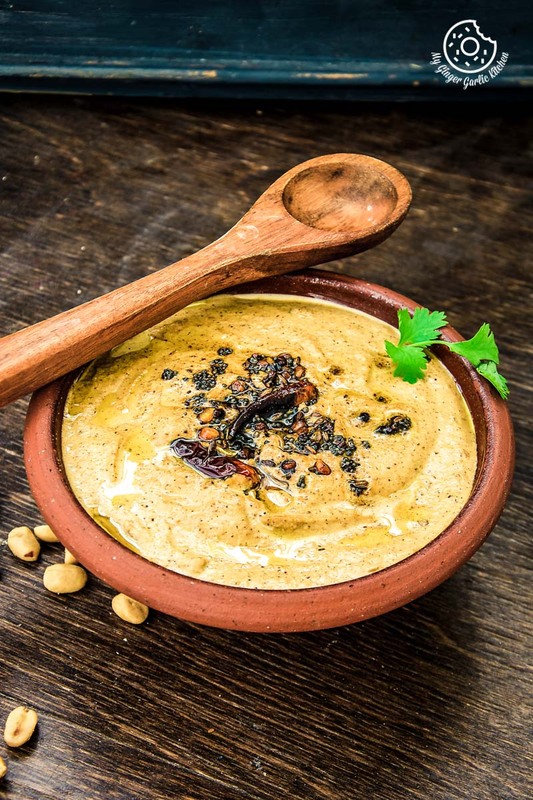 If you are someone who adores garlic and peanut, then you would surely love this chutney. Though I am loving my frequent dates with the little one, I am also missing my kitchen. So this week I have decided to be in the kitchen and cook so much. The chutney itself is a basic mix of roasted peanuts, garlic, some dried chilies, tamarind, jaggery, and salt. And the combination of these ingredients gives you a thick, classic, creamy, sweet, and spicy-nutty chutney. 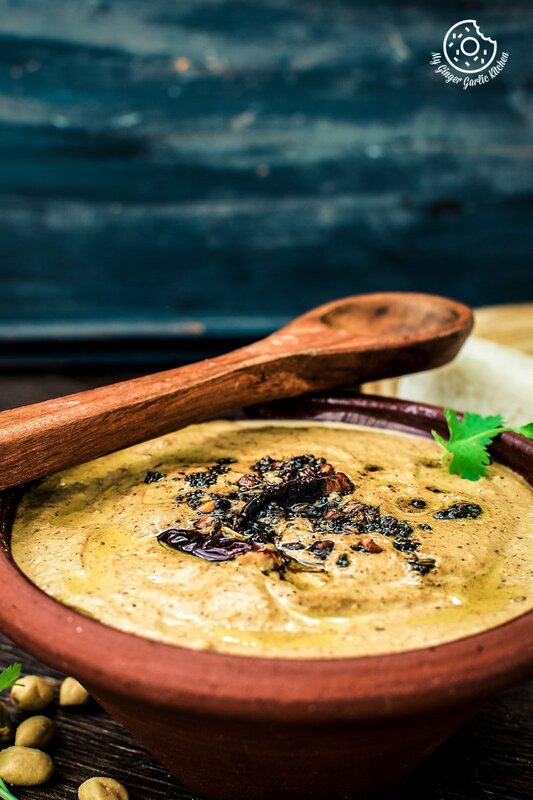 This super simple protein rich chutney can really sparkle any lunch or dinner platter. You can even spread it on a slice of bread or toast, and you won’t need anything else. Believe me, that’s how my family and I enjoyed it. It’s divine. This Peanut chutney I am sharing today is inspired from Andhra style chutney which is also called ‘Palli Chutney’. I have seen many South-Indian peanut chutneys but this one is my favorite. This chutney is inspired from a peanut chutney I learned from a friend who belongs to Andhra, a southern state in India. 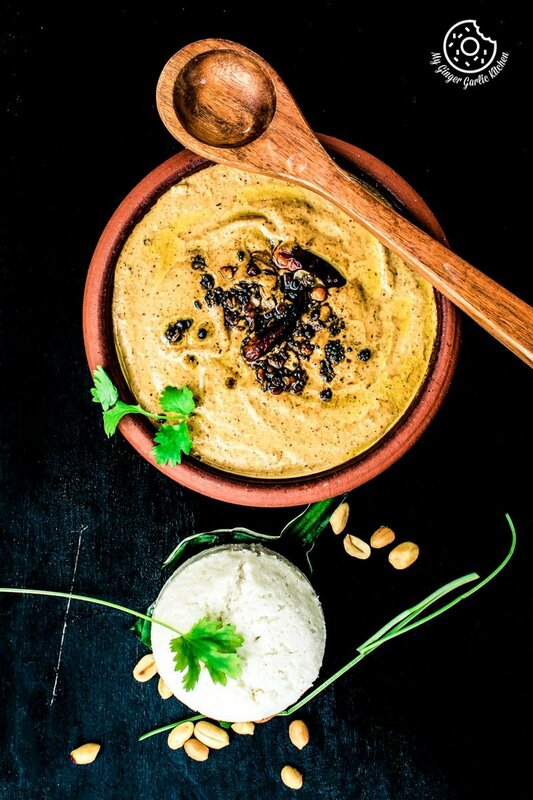 There are so many different ways of making a peanut chutney and I created this one which is loved by my family the most. I usually make this chutney the South Indian way and then I temper it the North Indian way. That way I get the best of both worlds. Curry leaves are a must in South-Indian chutney recipes, but I skipped that part. Instead, I added the garlic to the tempering for that EXTRA garlicky punch. This is best accompanied with idli, dosa & uttapam and all type of parathas, or any other Indian snacks. The roasting of lentils and peanuts is essential here. This is what makes this chutney uniquely tasty, so please do not skip it. I like to use the peanuts after removing their skin but you can grind them with their skin as well. 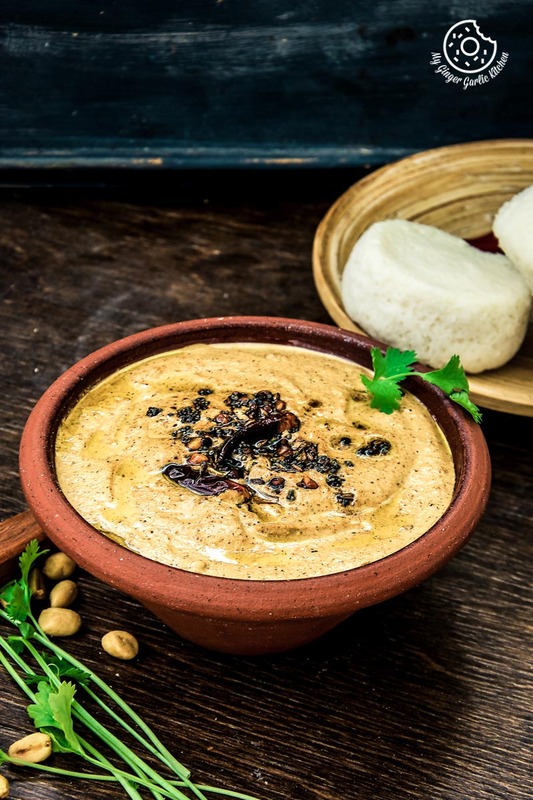 South Indian Style Peanut Garlic Chutney is a thick, classic, creamy, sweet, and spicy-nutty chutney. This is best accompanied with idli, dosa & uttapam and all type of parathas, or any other Indian snacks. 1. Dry roast peanuts on medium heat until golden. 2. Let them cool completely and remove the skin. 3. Heat 2 tbsp oil in a pan. Add urad dal, mustard seeds, cumin seeds, chana dal and saute them for a minute. 4. Now add garlic cloves, ginger, dried red chili and roast for 3 minutes. 5. Add tamarind, roasted peanuts, salt and turmeric powder. Stir them and saute for 1 minute. 6. Add jaggery and saute another minute. 7. Transfer the peanuts mix to the blender. Add water and blend to make a smooth paste. 8. Pour chutney into a bowl. 1. Heat 2 tsp oil in another. 2. Add asafetida, urad dal, chana dal, mustard seeds and cumin seeds. 3. When they start to splutter add dried red chili and garlic cloves and saute for 1 minute or until the garlic cloves are golden in color. 4. 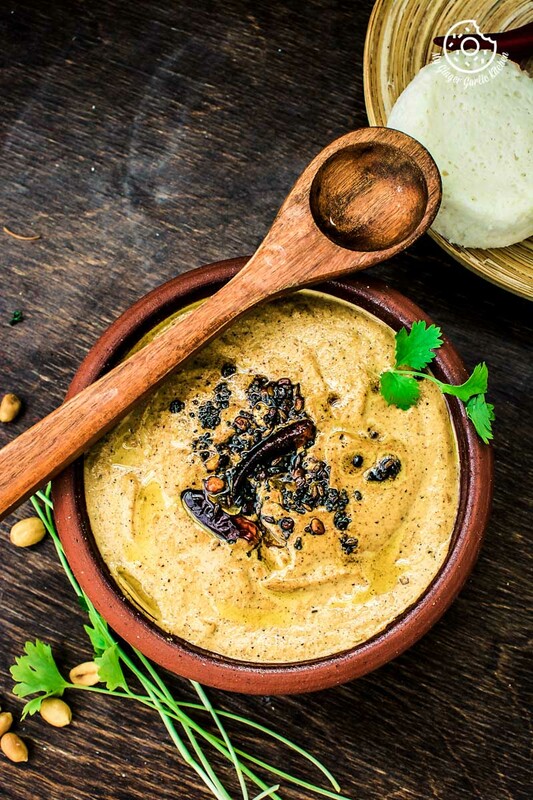 Pour the tempering over peanut chutney and serve along with idli, dosa, or paratha.